Lattice diffusion treated corundum is treated with a heat treatment at high temperatures with beryllium that deeply penetrates the gem material to alter the color. magnification with immersion, maybe fluorescence, higher than expected RI and pleochroism. For stones treated with beryllium you might have to use immersion with methylene iodide and maybe mineral oil. A blue filter is helpful when trying to detect faint color zoning in yellow to orange stones. Stones can have an over the limit RI if treated with cobalt or chromium. Some stones might appear orange because the red layer polished of to reveal yellow core. Stones might have a unnatural, uneven or watery appearance. If stones are diffused with heavy elements chromium and titanium color concentrations are seen on facet edges, pits and surface reaching fractures. The stone might show color bleeding around fractures. Stones should be viewed using immersion and diffused light. Beryllium treatment of corundum lightens the color in over dark stones. 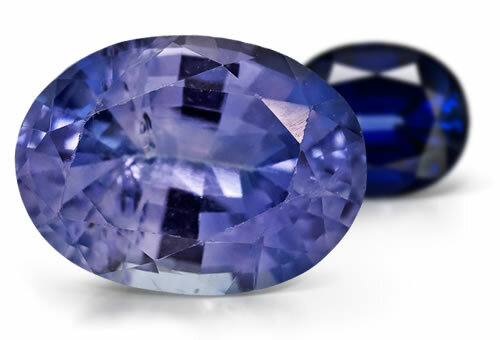 Beryllium treated stones need be viewed with magnification and immersion to see if there could be a colorless area surrounding a blue core. In red stones treated with beryllium diffusion there could be a layer of synthetic overgrowth that can be seen in polarized and darkfield lighting. Treatment can cause fern-like recrystallization of what was once zircon crystals within discoid fractures. Immersion with methylene iodide is best for identifying beryllium diffused stones but mineral oil can also be used. Orange stones treated with beryllium diffusion will penetrate 20% to 80% into the stone, but some stones show 100% penatration and the color concentrations will not be obvious. Synthetic overgrowth might form on stones that have been treated at high temperatures. Due to the higher treatment temperatures in orange stones zircons crystals are often damaged.